About three weeks ago I headed down south as it had been awhile since I’d been down there. I managed to tear around all over the place and see all the familiar spots that we all love. The swell that weekend was absolutely massive, I headed down to Wyadup Rocks my first morning down there and if you’ve ever been to them early morning you’ll know that you spend more time looking at the ground trying to make your way down there rather than looking at the scenery. Imagine my shock when I got down amongst the rocks and looked up at this wave that arrived out of the dark almost head height and slammed into the rocks! I got drenched and the car had said it was 4 degrees before I got out of it, fortunately the camera was still dry. I setup shop a little bit further back up the rocks and got some great photos. Saturday evening saw me out at Canal Rocks and I took a walk around to the left of Canal Rocks instead of shooting Canal Rocks themselves and was presented with some really interesting rock formations. This is a photo from that location settings were: F16, iso50, .3sec shutter speed. The swell was still thumping through so I had to keep an eye out for the really big waves and scramble if I saw one, it was a hair raising experience!!! Who said Landscape Photography was boring? I visited Bunker Bay on Saturday morning and even though I didn’t get anything I was happy with I certainly walked away with a whole stack of ideas for another shoot there. My favourite part of this photo is the water movement on the bottom lefthand side of the photograph. I’ve never managed to capture water streaking across like that before. Has anyone else been down south recently? 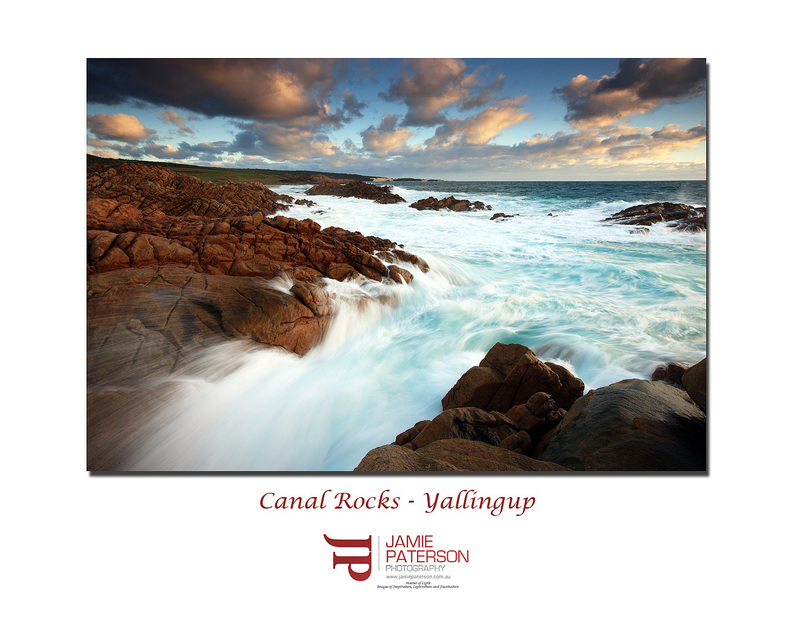 This entry was posted in Australian Landscapes, Australian Seascapes, Sunset Photos, Wave Photos and tagged australia, canon, dunsborough, Jamie Paterson, landscape, long exposure, ocean, photo, seascape, south west, sunset, water, waves, western australia, yallingup. this makes me want to travel to perth! Thanks for commenting. I used F16, ISO50 and .3sec for the shutter speed. Perth isn’t the greatest for landscape photography but down south a few hours out of Perth. Thanks for stopping by and commenting. I’m glad you liked the photo. I didn’t get wet when taking this shot. I was able to see the waves as they were coming at me. Thanks for commenting. Thanks for everyones comments so far. You all ROCK!!!! very very nice mate well done!!! that water looks great!! Much appreciated mate. I’m heading back down there again shortly but I’m guessing the Greek Islands where you are, are much nicer. Thanks for commenting. I really liked the sky as well as you say it wasn’t intense so it didn’t overpower the photo. Very nice. I love the colour of the rocks. How is that lens going? I was stoked with those rocks, I’ve seen Christian and Neal’s photos with rocks red like that and I have never managed to capture that colour until now. Woo Hoo. Great photo, Jamie. Love the colors! Thanks for that. When are you and Jace coming back to Perth? I’ve got a Cottesloe photo waiting for you. Hi Jamie, great image mate. The spray certainly does make it as it contrasts so well with rocks. Thanks for the comment. The more I look at that spray the more it absorbs me. I do like this one very much Jamie, great image. The rock texture and that water movement is really nice! Thanks Flemming. As I’ve said I was pretty happy with this image. I love this photo… nice color and balance. How wonderful it would be to see this landscape in person. Thanks for sharing your gift Jamie and thank you for leaving a comment on my site. Thanks for your kind words. It certainly was an amazing site to behold. posted on your flickr, Sweet water movement and nice light too! Thanks for the comment. I’m heading back down there within the week to shoot the area again. I can’t wait. A real cracker of an image mate!!! Fantastic photo, Jamie. Well composed, brilliant colour, great exposure, well processed. Very nice, indeed. Thanks for that great comment. Brought a smile to my face, the best thing about this photo is that there was almost no photoshopping. Wish I could get more photos like that!